The aims and purposes of the Society are summarized in its constitution – the promotion of high scholarship and original investigation in all branches of pure and applied chemistry. The founders envisioned a society dedicated to these objectives which would serve the field of chemistry in much the same manner as Phi Beta Kappa does the humanities; Sigma Xi, scientific research; and Tau Beta Pi, engineering. Throughout its history, Phi Lambda Upsilon has been consistently devoted to its objectives as an Honor Society. 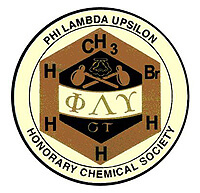 Phi Lambda Upsilon was founded as an honorary chemical society in March 1899, at the University of Illinois. This was the first honor society dedicated to a single scientific discipline. A survey of our history reveals three distinct periods. Founding, growth and entrenchment of Alpha Chapter at the University of Illinois comprise the first period. The second period began in 1906 when Beta Chapter was established at the University of Wisconsin. Five more chapters were chartered prior to 29 June 1911, the date of the convention at Indianapolis at which the national society was organized and the second period reached its culmination. From 1911 to date, the Society has effected a gradual rise in the standards for membership. This period has also been characterized by the development of programs of activity within the chapters consistent with the honorary character of the Society. In the span of ninety-five years, Phi Lambda Upsilon has grown into an organization comprising sixty-seven chapters and more than 55,000 members.